Harry Kelsey runs the Leicestershire pond maintenance branch for Head Squared Aquatics. He has been working with us since 2013 and became a franchisee in 2015 taking over responsibility for our pond maintenance contracts in and around Leicestershire. I have been working in the aquatic and gardening industry since 2011 and have maintained a strong interest in the hobby for many years before that. With my family, I helped construct a garden pond and stream when I was younger and since then have been fascinated by the nature, wildlife and whole ecosystem that is provided to you. Currently I am running my own 600 litre tropical freshwater aquarium, which is housing a range of large South American fish. In my spare time I am designing a second self­sustained, planted invertebrate aquarium which I hope to commission shortly. Worked in aquatic retail for 2 years prior to joining Head Squared Aquatics, maintaining an extensive range of tropical freshwater aquarium livestock as well as a large variety of pond fish, including koi, and plant stock. Regular experience working within the water gardening trade with a reputable RHS Chelsea Flower Show water garden supplier, whilst also annually assisting at the show. Currently running a 600 litre tropical freshwater aquarium, housing a variety of large South American fish including cichlids, catfish and a silver Arowana. Currently run over 60 pond and aquarium management contracts across the Midlands. Enjoy travelling and short European city breaks, collecting music and reading fishkeeping magazines. In my spare time I am regularly outdoors either walking, cycling or hiking (when the weather’s right! ), visiting local aquatic retailers or enjoying a good old British pub. A Level Certificates in Industrial Product Design and Business Studies. Final competitor in National Rotary Young Designer (2011) and 1st prize winner of college design competition. Briefly studied Industrial Automotive and Transport Design at Coventry University for 1 year. 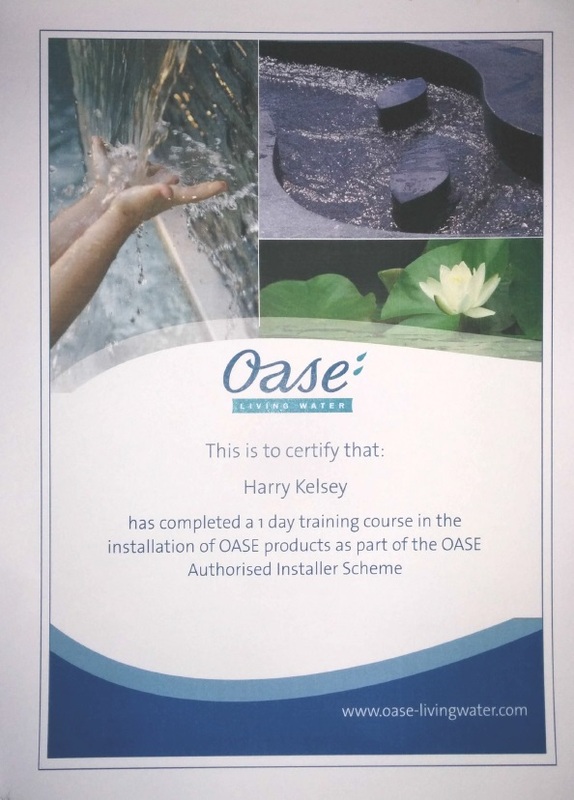 Completed OASE authorised installer scheme.